This is the 23th pack in the Romping & Roaring Number Packs. 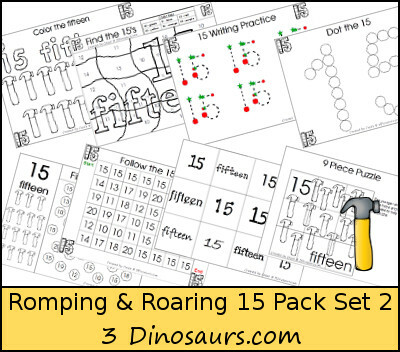 There are 33 sets in the Romping & Roaring Number Packs. It has a cooking theme to the pack. This is the second of the two 15 packs. 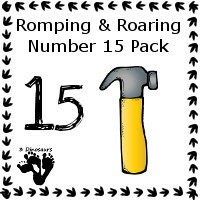 This Romping & Roaring Number 15 Pack is part of the huge set. There are 33 packs total and 11 extras that are really neat that match up with this set. If you don’t want to wait for it to come out every other week you can purchase it in advance at Teachers Notebook or Teachers Pay Teachers! I always try and keep in mind you don’t have to use all the pages. You can vary up what pages you like or just use the pages you and your kids loved the best! I know that my girls love variety and are always looking for a challenge. The next Romping & Roaring Number 16 Pack will be out on October 28th. This entry was posted in numbers and tagged free, number sets, printables, romping raoring, tools. Bookmark the permalink.